A Little Hut - Patricia Zapata: a little hut has a new web site! 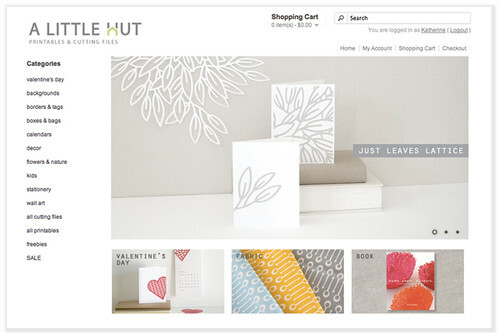 a little hut has a new web site! We're starting off 2012 with an awesome completed project. The new site for A Little Hut is here! It has been a long time coming and I'm very excited about this big improvement. It was a LOT of work. It was a total team effort—I don't know what I'd do without my Mr. Z who did all the programming. He's so patient with all my requests! So, so patient. - You will no longer need to wait for an email from me. You will be able to download all files immediately after paying for them. Only freebie files will need to be approved internally by me—which only means you'll just need to wait a bit (like with orders on the old site). - You will be able to see your order history. You will have a handy list to remind you what you have ordered in the past. - Products will be easier to find. The navigation from one section to another is quite simple. - More photos and views will be available for products that I upload in the future. For now they have about the same amount of photos that I've used previously. - I've added the icons below to clearly describe files that are available for each product. Some of you like to use cutting files, some of you want to print and cut by hand, some of you want to print only. Now you will know what is included in each set. The Product Information page explains these symbols in more detail. For those of you that have registered and made purchases on A Little Hut in the past don't worry, your information (personal contact information - not previous order history) was transferred to the new site. The only thing you'll need to do is create a new password. Sign in with your email address, click on Forgot Password, you'll get an email with a temporary password. Use that password to sign in and in My Account you can change your password to whatever you prefer. That's it! If you have any questions just use our Contact Us page. I think we accomplished what we wanted—a better experience for visitors and a more efficient and up-to-date site. I happen to like how it looks too! Hehe. If you find any glitches, typos or anything that you think we can work on please feel free to let me know. I want to make the site the best that it can be. Stop by and visit the A Little Hut to check it out. I hope you like it!